Tate’s Raised Access Floors are cost-effective and flexible solutions, offering lasting value that can adapt and evolve throughout the life of a new or retrofit building. 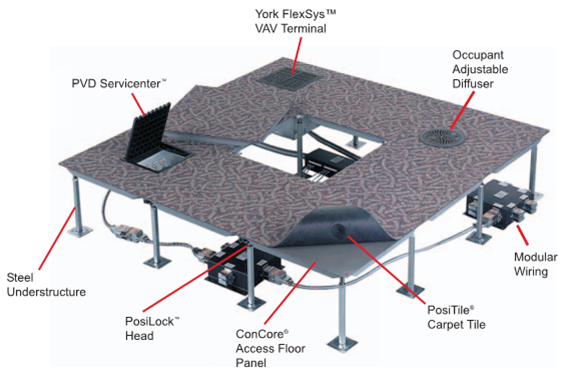 At it’s lowest 3” profile, the floor creates a pathway for routing wires and cable. At it’s maximum height of 36”, it enables AC and other utilities to run below the floor. Panels are concrete filled 24” x 24” and can be provided from 1000 lb. to 3000 lb. assemblies. – 3” to 36” inch profile conserves vertical space. – Allows for easy access to power, data and under -floor utilities. – Supports collaborative work environments. – Provides a level surface for furniture and demountable walls.